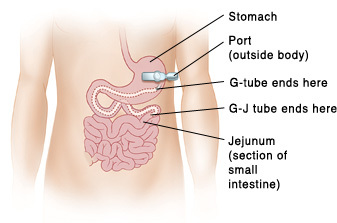 Your child has had a tube placed in his / her stomach called a gastrostomy tube or G-tube. This tube provides another way to offer food and / or medicines. It also can be used to vent your child’s stomach for air or drainage. Click here for Gastrostomy Tube (G-Tube) Home Care tips provided by Cincinnati Children’s Hospital.